"Eurofora" was Invited at an interesting and timely Romanian EU Presidency event in Bucarest, focused on Peace-building, with keynote Speaker the Minister of Foreign Affairs, Teodor Meleșcanu, and many former Heads of State/Government from the surrounding Eastern Europe, Balkans, Caucasus, Ukraine, Russia, Korea and other Countries, (several from the Historic era of Berlin Wall's fall), co-organized by an Institute headed by the former President of Romania, Emil Constantinescu, and UN-accredited, Peace Activist NGO HWPL from South Korea, on 1 and 2 April 2019. 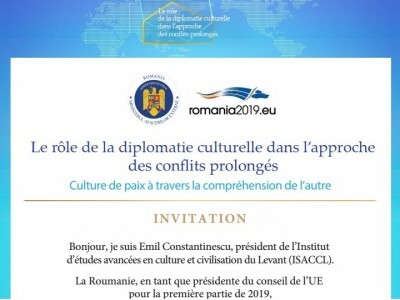 The declared aim is also to create a "Forum-Debate" for the foreseable Future, gathering Together various Heads of State/Government, Politicians and Diplomats, Experts and University Researchers, Civil Society, etc., about Cultural Diplomacy in the Resolution of protracted Conflicts, through Mutual Respect of eachother's History, Dialogue between various Identities, and research of Joint Interests for Strategic Partnerships, in a Multi-Cultural and Multi-Religious Co-Existence, in order to create Trust and a Peace Culture Worldwide, according to the organizers. 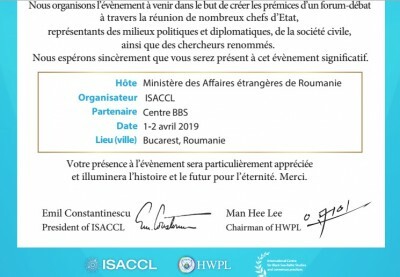 By a coincidence, "Eurofora"'s co-Founder had been First Invited to Romania by the PanEuropean Council of Europe, precisely during the Presidency of the Country by Emil Constantinescu, as early as since back on 1997 ! And, Nowadays, the new UNO's Secretary General, Antonio Guterres, (with whom we have cooperated at various occasions in the Past : Portugal's PM, EU/CoE Presidency, UNHCR, UNSG, etc), is expected here in Strasbourg, on mid-April 2019, to address CoE's Parliamentary Assembly, while Peace-Building was notoriously his main Focus during a hard-fought pre-Electoral Campaign at the International Organisation's top. Almost at the Same Time, there is a Crucial for Peace Election of Ukraine's President between the Ends of March and April 2019, while the Topical Issue of Korean Pennisula's De-Nuclearisation, ReConciliation and evental ReUnification, etc. has come at the forefront of World-wide attention, parallel to recent Developments in Syria and elsewhere, including UNO's efforts to crystalize the terms of reference for an eventual revival of Top Talks for a Solution of Cyprus' issue, (etc). The Invitation (initially addressed to "Eurofora" as well as to other Journalists from "France24", "EuroNews", "RadioFrance" and "Express") covered the main Expenses and the organizers kindly offered to try to Help us for Fast-Track, last minute, practical solutions to Logistic matters. But an Exceptional Overload recently provoked, inter alia, also by 2 Plenary Sessions of EU Parliament in Strasbourg on March 2019, in the run-up to the crucial forthcoming EU Elections, followed by CoE Assembly's (and CLRAE's) Spring 2019 Session on April, EU-China Top Level Meetings in Paris and Brussels, ECHR developments, various local events, (etc), did not left us enough Time, not even to sleep, after some Bureaucratic interferences, here or there, had also provoked a series of Delays with whom we had to try to catch up asap... Therefore, we regretted to be obliged to finally decline this offer (at the last minute, and after having tried to deal with some practical, Time-consuming a.o. issues : Comp. Supra), and whole-heartedly Wish to the Organizers the Best possible Success in their interesting endeavours on an obviously important issue of Nowadays World, Hoping to eventually join them at another occasion later-on.